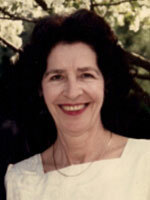 Jean Marie Coble, 83, of Lancaster, entered into rest on Sunday, October 2, 2011. She was married 25 years to Donald E. Coble. Born in Lancaster, she was the daughter of the late Charles Darnell and Dorothy “Mimi” Swarr. Jean was a secretary to the president at Teachers Protective Mutual Life Insurance Company for 26 years. She was a graduate of J.P. McCaskey High School. Her interests included jazz music, dancing, reading, the beach, and was known as a diehard fan of Philadelphia and Penn State sports teams. She spent many hours as a volunteer working with abused children. Jean was a member of the Cotillion Dance Club and the Lancaster Road Running Club. Surviving besides her husband is a daughter, Rebecca Stamm Williams; three sons, Michael husband of Nancy Schaum Ault, Stephen husband of Donna Smallwood Ault and Paul husband of Vicky Harrison Stamm all of Lancaster; two step daughters, Tamara Coble Garrett wife of Ernie Garrett of Willow Street, and Cynthia Coble Albright of Lakeland, FL; a step son J. Todd husband of Kerry Pease Coble of Lancaster; eight grandchildren, six great grandchildren, three great great grandchildren; and three sisters, Helen Darnell Fisher of Lancaster, Mary wife of Dr. Harold Harris of Millersville, and Arlene Boas of Lancaster. She was preceded in death by a sister Leona Darnell Wagner. A Memorial Service will be held on Thursday, October 6, 2011 at 3:00 P.M. at Pequea Brethren In Christ Church, 40 Church Road, Lancaster, PA with Rev. Robert Brody officiating. Friends may call at the church on Thursday from 2:30 P.M. until the time of the service. In lieu of flowers, contributions in Mrs. Coble’s memory may be made to the Lancaster County Children and Youth Social Service Agency, 900 E. King St., Lancaster, PA 17602. Visitation Time: 2:30 to 3:00 P.M.